Aging populations face diminishing quality of life due to increased disease and morbidity. These challenges call for longevity research to focus on understanding the pathways controlling healthspan. A new study, led by dr. Peter Fedichev (Gero LLC) and prof. Yurii Aulchenko (PolyOmica), used the data from the UK Biobank to understand biology of healthspan1. We observed that the risks of major chronic diseases is doubling every 8 years. Assuming that aging drives the acceleration in morbidity rates, we build a risk model to predict the age at the end of healthspan depending on age, gender, and genetic background. 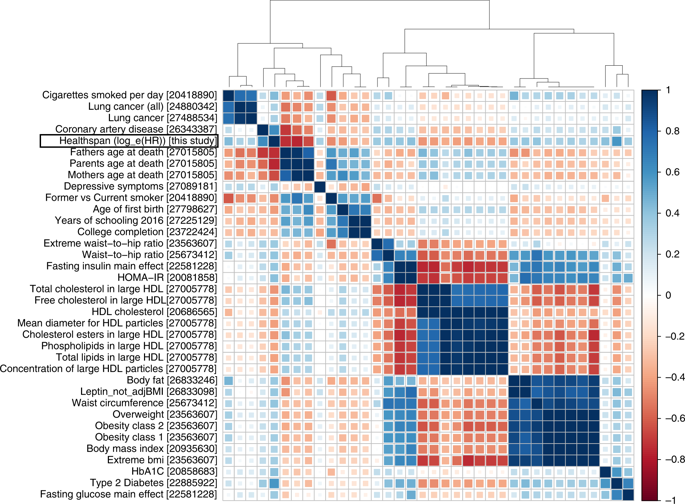 We identify 12 loci associated with healthspan at the whole-genome significance level and find strong genetic correlations between healthspan and all-cause mortality, life-history, and lifestyle traits (see Figure).